Sadly, there are no bullet trains on the journey to reaching your fitness potential. No magic pills or incantations will eliminate the time and effort that goes into setting priorities and working towards fitness goals. Working out does--believe it or not--require some work to achieve results. However, there are tools that you can utilize to make your fitness journey safer and more efficient. TRX MAPS is one of those tools, and we're thrilled to announce that select Cal Fit locations now offer this state-of-the-art body movement assessment. TRX MAPS analyzes your individual mobility, muscle activation, posture, and symmetry to prescribe a better, more effective workout for you. 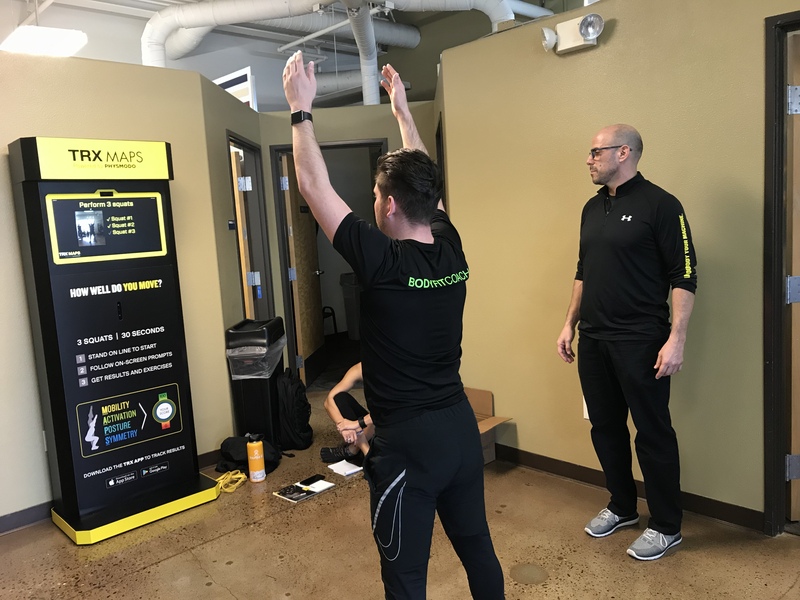 Unlike other movement assessments that can be time consuming and require interpretation, TRX MAPS utilizes state of the art 3D technology, gathering thousands of data points to complete an accurate full body assessment in less than 30 seconds. By performing just 3 overhead squats, the system measures your mobility, activation, posture, and symmetry. According to the International Journal of Sports Physical Therapy, movement ability is an often overlooked component of sports science, and can be an important means of evaluating fitness and performance. Results from your scan are delivered on-screen and via email or mobile app, and included targeted exercise plans that address the areas of weakness that were identified. The exercises suggested are specifically tailored to your issues, helping you to to better plan and focus your workouts. Best of all, TRX MAPS can benefit people at all stages of fitness to improve their form and maximize their workout time. Every fitness goal starts with moving better. TRX MAPS is an accurate, judgement-free way to check your form. And with the handy tracking tools offered via the online app, regular body scans can be a useful tool for monitoring progress and adding an element of motivation to your workouts. TRX MAPS are available at our Folsom and Elk Grove clubs. We invite you to speak to a fitness manager at these clubs club to make an appointment for your complimentary scan. Or Make an appointment for TRX mapping at Cal Fit! Appointments are currently offered at our Folsom and Elk Grove clubs. Call Folsom at (916) 932-0100 or Elk Grove at (916) 685-5555 and ask for the fitness manager to make your appointment.